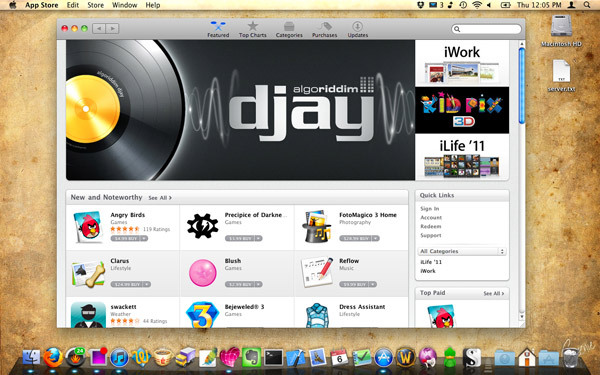 How do you get the Mac App Store in the first place? Just hit the Software Update item in your Apple menu and update to Mac OS X 10.6.6. 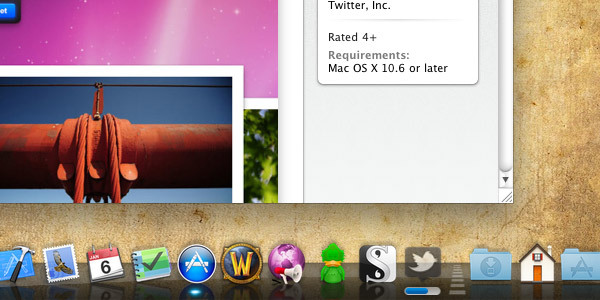 After the reboot, you should see a new App Store icon in your dock. After dragging it to a more comfortable placement in the dock (Firefox is supposed to be the first item, Apple, don’t change it on me!) you’re ready to go. Browsing the store is much like downloading iOS apps in iTunes, only the App Store application is so much lighter and more responsive. iTunes takes forever to switch pages, as it’s basically loading full-size web pages from Apple’s servers for every request. 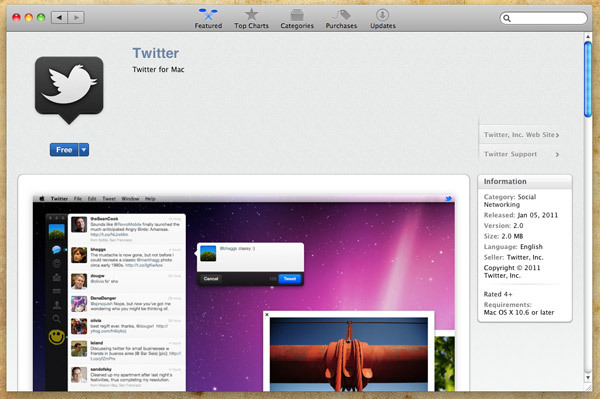 I don’t know what they’re doing for the Mac App Store, but it works a lot better. Screenshots are displayed prominently, with some assorted information off to the site. Reviews, of course, are placed down below the screenshots and description. When you click on the price button and enter your Apple login details, the application’s icon appears in your dock with a progress bar, much like in iOS. Once it downloads, you can launch it straight away. I don’t know if there is an easy way to migrate older applications to being managed by the App Store or not. It would be handy, since a lot of the free ones I use (TextWrangler and Evernote, for instance) are now available in the App Store. Paid software would be more of a challenge. 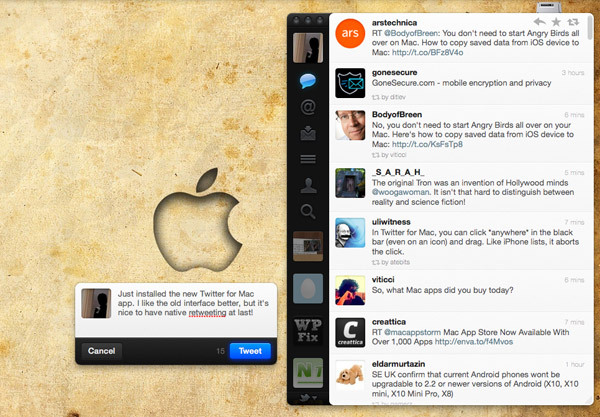 You can read more about Twitter for Mac over at MacStories. Federico Viticci wrote up a lengthy post about it. 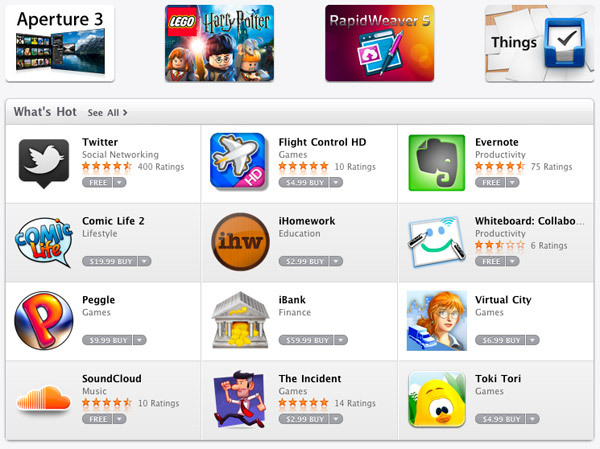 Tweetie 2 is the reason I downloaded the app store. Been looking forward to this for a very long time as well! I know the design style is quite different, what do you think of it so far? I know we’re still in the “change is bad” stage and may be a bit biased against it, but tbh, I think the black is a little too stark. Every other app on my screen is that nice silvery chrome color. Why’d they have to change it? It’s good overall. (I avoided talking about the design, since everyone else is. The tight margins bother me the most, though.) But I think it’s weird that so many features were removed in the new version. The followback status and support for other URL shorteners, for instance. I’m happy to finally have the retweets, though. Yeah, I miss the follow back status especially. Can be very useful to see! I guess the URL shortener issue is one of the effects of moving from a 3rd party app to an official one though. They’re only going to recommend their own shortener. Kind of a shame, I loved seeing my bit.ly stats page from time to time.